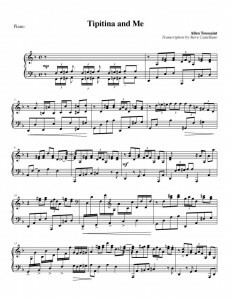 This is probably some form of copyright infringement, but I have completed my transcription of Allen Toussaint’s Tipitina and Me, and since his publisher’s website clearly states they are not interested in publishing unsolicited transcriptions, I’m just going to give it away for free here. It’s a very rewarding piece to play. It’s a catalogue of New Orleans piano riffs, but not as technically challenging as a lot of the Dr. John stuff I’ve tried to read through. If you’re familiar with (Canadian) Royal Conservatory grading I would call this about a grade eight or nine level solo. Just for the sake of my reputation as a typesetter, I should point out that if I was actually planning on submitting this for publication I would have spent a little more time on note spacing and articulations. But my objective here was to get it onto four pages quickly in an accurate and legible format. I did start to put phrase markings in at one point but they are somewhat subjective, and giving the recording a listen would tell you a lot more than I could in a lot less time. If you don’t know the tune, it’s available from the iTunes store as a single or as part of the 2005 Our New Orleans compilation. Feel free to let me know in the comments if you find any errors or have any suggestions for readability. Updated January 25, 2011: I’ve made some updates based on revisions from a keen-eyed pianist friend. I think we’re getting close. Keep those cards and letters coming. Thank you for posting this. I’ve just downloaded it and looking forward to playing. I can’t thank you enough for the Tipitina transcription! There’s no way I could ever have figured it out. Play it regularly. And thought ‘I’d love to play this’ googled and found your transcription. Just listened again and followed on the pdf. Perfect! I know how tough it is transcribing jazz piano so hats off to you Steve. Now just need to limber up my fingers…. Stellar! I try to start my day with this every morning. Have you thought about a transcription of his arrangement of Silent Night? Just…wow. This is amazingly well done. Thanks MT! I spent some time as a professional music typesetter in the nineties but there just wasn’t enough work to keep it going. Hopefully I’ll have some time to do some more transcriptions in the future. Has anyone done a transcription of Allen Toussaint – It’s A New Orleans Thing? Would love to have a transcription of Toussaint’s Mardi Gras in New Orleans! Thanks for this transcription! That would be an interesting challenge. It would be a worthy follow-up, as it’s quoted in the coda of this one (as you probably knew). today I found your transcription of ‘Tipitina and Me’ on the net (great work!) and I really appreciate this kind of donation to the world. I downloaded this and love it (although I can’t play it very well yet)! I was looking for a transcription of Toussaint’s arrangement of Mardi Gras in New Orleans” as played on his 2016 American Tunes album. Is there any chance you will be transcribing it or know where I can find it? Thanks so much for what you do!